While I love my “goto” friend the boneless skinless chicken breast, sometimes I just need to go caveman, and tear some meat off the bone. And while I love whole roasted chickens, there is an in between step we shouldn’t gloss over. Here I show you a recipe for Roasted Chicken Breast (the bone in, skin on) in a tarragon and mushroom sauce. Roasting a chicken breast like this has the advantage of one, a nice, tasty skin, and two, a bone that actually helps keep the chicken more moist and tender. They are not hard to cook and work great with all kinds of sauces, like this mushroom tarragon combo that is absolutely killer. Hope you enjoy this roast chicken breast recipe as much as I do. 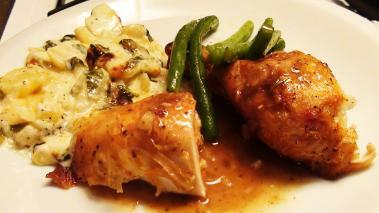 I love this type of meal as my Sunday supper with the family and I hope you enjoy this chicken recipe as much as I do. Wine Recommendation: You’ve got a lot of wine options with this chicken recipe, on both the red and the white side. For me, just about any time I see mushrooms, my mind goes to Pinot Noir, and especially those from Oregon’s Willamette Valley. The earthiness, and light flavors, with mild tannin will go perfectly with both chicken and the sauce (in fact it wouldn’t hurt to splash a bit in the pan to deglaze while making the sauce!). Enjoy. Where do you add the garlic and shallot?